Humans did not accelerate the decline of the 'Green Sahara' and may have managed to hold back the onset of the Sahara desert by around 500 years, according to new research led by UCL. The study by a team of geographers and archaeologists from UCL and King's College London, published in Nature Communications, suggests that early pastoralists in North Africa combined detailed knowledge of the environment with newly domesticated species to deal with the long-term drying trend. It is thought that early pastoralists in North Africa developed intricate ways to efficiently manage sparse vegetation and relatively dry and low fertility soils. Dr. Chris Brierley (UCL Geography), lead author, said: "The possibility that humans could have had a stabilising influence on the environment has significant implications. We contest the common narrative that past human-environment interactions must always be one of over-exploitation and degradation. "The fact that societies practising 'pastoralism' persisted in this region for so long and invested both economically and ideologically in the local landscape, does not support the scenario of over-exploitation. Our study shows that increasing human population and sustainable pastoralism did not accelerate—and may even have delayed—the decline of the 'Green Sahara'." Around 8,000 years ago, the Sahara wasn't desert, but instead was a vibrant ecosystem that supported hunter-gatherers and fisherfolk. The 'Green Sahara' - the colloquial term for the African Humid Period – was the period in which North Africa became much wetter than it is today thanks to a series of monsoons. As the Earth's orbit slowly changed, the rain started to reduce, and the vegetation started to die back. Around 5,500 years ago, the ecosystem in the Sahara went into a terminal decline towards the desert we have today. Pastoralism (nomadic or semi-nomadic cattle-herders) blossomed in the Sahara from around 1000 years before that collapse. Previous studies have put the blame for the collapse of the 'Green Sahara' onto these nomads who have often been marginalised in history, but this latest studies dispels that myth. The study uses a novel climate-vegetation model to determine whether the end of the African Humid Period occurred earlier than expected. The model keeps track of variables such as vegetation and rainfall, and other processes such as the amount of energy coming from the sun, and the amount of carbon dioxide in the atmosphere. The model found that the 'Green Sahara' should have collapsed earlier than it did. This suggests that pastoralists lasted longer than expected and the techniques they used helped them to adapt to the environmental changes. Dr. Brierley added: "Those places where pastoralists last longer are where there are more resources. It's a good adaptation to the climate change taking place at the time. There is now work today looking at what we can learn from nomadic pastoralists, such as selective grazing strategies, which can be applied to sustainable adaption to desertification that we expect from future climate change." 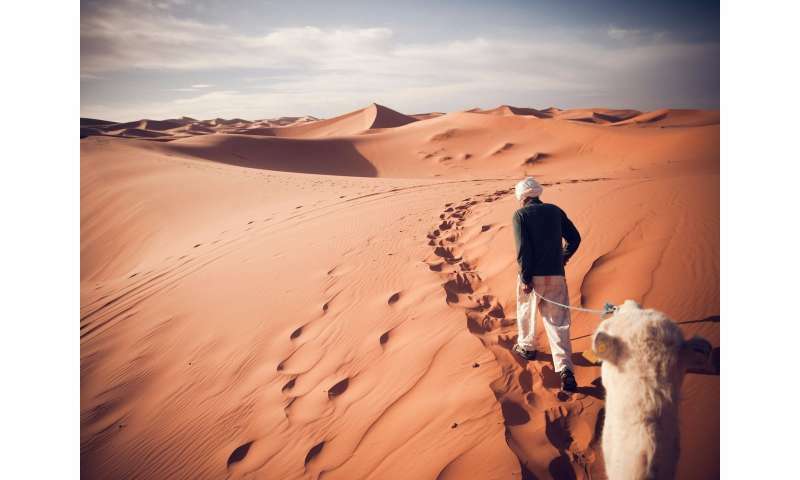 Dr. Katie Manning (King's College London), concluded: "Despite the largely inhospitable conditions of the Sahara today, it is not hard to find evidence of human occupation from the last 11,000 years. Thousands of rock art sites illustrate a lush environment, large-game hunting and livestock herding. The spread of domestic animals across the Sahara occurred at a time of increasing climatic instability, and yet, these pastoralist populations thrived. "It is likely that strategies used by contemporary traditional herders, such as seasonal movement and selective grazing, were also used by these early pastoralists, helping to maintain an otherwise deteriorating ecosystem." Here we go with the models again. A puzzle, which was the cause & which was the result? It's nice that these researchers wish to be polite to modern pastoralists. A pleasant change from the utter contempt, smug, cocooned, entitled First Worlders usual treatment of the less affluent. The generalities in this study are reasonable. Even if only locally across the Sahara. Similar to the greater Gobi region & the North American Southwest. The Sahel, Arabia, the Yucatan, South America & Australia. All these deserts are the result of Human exploitation & thousands of years of using fire as a tool & a weapon. But not as simple as girdling & chopping down all the trees from horizon to horizon. Diminishing rainfall. I think the real key to causing a desert is the burning of the micro-biome. Across generations & centuries, for millennia. The micro-organisms in soil can only sustain so much trauma. Which supports the the theory that grazing cattle adding their droppings, revived grasslands. For a while. MCLD, would you deny the value of model airplanes, model rockets or even paper airplanes as a teaching tool? Many of the pioneers of aviation and now rocketry experimented with models. All the way back to Choe Mu-seon and Da Vinci. Now you may be better informed than Leonardo or for that matter, those wacky Wright kids? Your comment casts doubts if you are as smart as any of them. So to summarize. Are you going to insist that you should be handed the launch codes for a full-on Atlas rocket? Without a whole lot of education, training and an in-depth psych evaluation? Remember, man is the sole component of negative change, exofactors are nonplayers. Human populations were far too small to significantly affect plant cover during the North African wet phase. It only became an issue much later, well after natural climate changes led to a drying out of the region. My own study, the most comprehensive archaeological-historical review of the drying phase of the Sahara and other connected deserts of Arabia, Middle East and Central Asia, shows a general coordinated drying dominantly after c.4000 BC. Look up "Saharasia". This is a largely controversial and censored work, as it also documents a shift from peaceful to warlike conditions after that general marker date, in coordination with the climate shift. A natural climate shift, which severely affected humanity, not the other way around. James_D: "My own study, the most comprehensive archaeological-historical review of the drying phase of the Sahara and other connected deserts of Arabia, Middle East and Central Asia...This is a largely controversial and censored work"
No peer-reviewed publication? Are you yet another unsung genius kept down by the scientific conspiracy? Yes, primitive Africans easily controlled global weather, but today's self-proclaimed 'scientists' can't even accurately predict the weather, let alone control it. rrwillsj, there's a HUGE difference between model airplanes, model rockets, or paper airplanes, and computer models. There's also a difference between "teaching tools" and science. Talk about someone who shouldn't have access to nuclear launch codes. Goodness, yours is a depth and breadth of stupidity rarely seen. Thankfully. rrwillsj, the reference by MCLoweDallas to "models" wasn't about using physical models for experimentation leading to full-scale devices, but using computer models and then claiming they show what actually happened. Apples and oranges. And at any rate, jumping to the notion of taking control of an Atlas rocket is preposterous hyperbole. Maybe you should work on your own intelligence a little more before snidely attacking that of someone else. Green global warming Marxists will jail you for suggesting this. Oh, Thrip_Buns, those aren't the MIB keeping you confined. Your caretakers are the Men In White. Better Luck on your next evaluation by the Psych Board! As for the rest of you whiners. I am baffled by your ignorance of the methodology for computer modeling/simulation. I suppose if you have never successfully managed a business? Planned a corporate or public event? Charity campaign? Election organizing? Church retreat? Multi-state family celebration? You never brain-stormed a school study-group project or social event? Never even planned a garden or a group hike/bike/canoe trip? To quote Van Voight: "The map is not the territory." Really?1? So you are not only home-schooled but kept locked in the basement? Or none of you have ever had a job more skilled than cubicle drone or bag-boy? So I'm guessing your knee-jerk rejection of scientific tools of computer simulations is? You are jealous that they get to play with shinier toys than your nurse allows you? Fascinating. The "increased desertification" idea was wrong, and now humans may have prevented some. Yes, it is called science. A useful tool - as the article show. If you don't like science, why bother reading about it? The article was about climate, which we can control - we are currently responsible for the rapid and hurtful global warming observed - not the weather. But maybe you were aiming at an anti-science, political, erroneous talking point? Such rambling is useless here. The evidence for that statement is sparse to non-existent. "We" are responsible? It is impossible to separate the human contribution to global temperatures from the natural contribution; just can't be done. The evidence suggests that the human contribution, indirectly through increased CO2 emissions, is overwhelmed by natural variation. Rapid? Ignoring the problem with poor siting of most weather stations that in fact measure the urban heat island effect generated by expansion of infrastructure, the global average temperature has increased about 1° C over the last century. There is only a century of "good" data so we have nothing to compare it to. The paleoclimate data doesn't have the temporal precision to tell if this rate is unprecedented. It likely isn't. Hurtful? In fact, the opposite is more likely; modest warming is more beneficial than harmful. aksdad, have you volunteered yet to assist in the continuing flooding from Hurricane Flo? It flows and it flows and it flows. You can come back on here and lie yourself blue in the face falsely claiming that Human activities do not worsen a natural disaster. None of us expect any better of you or the rest of the denier shills.